I must be crazy...I haven't finished my Farmhouse Modern Laundry Room makeover yet...and I'm starting on another room! But I just couldn't resist. Have you heard of the One Room Challenge event? It's where 20 bloggers make over rooms in 6 weeks and then hundreds of other bloggers join in as linking participants. 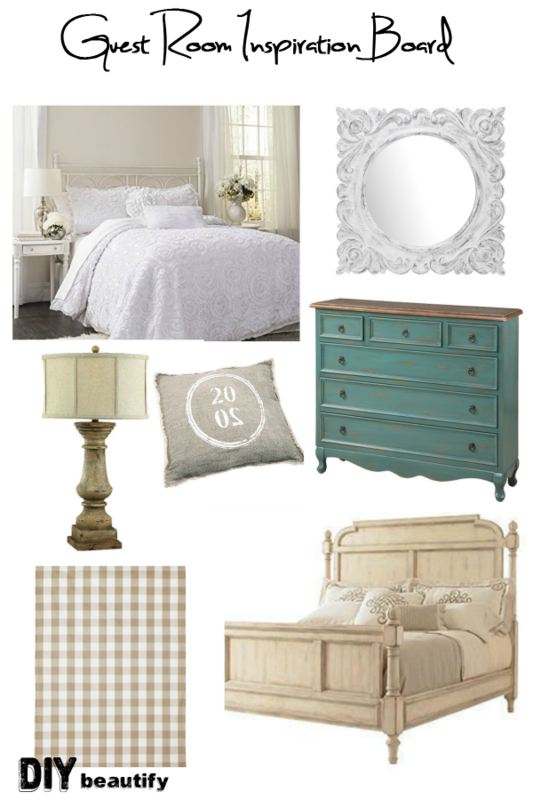 This will be my first year linking up to this event...I was excited to join and feel like I needed the motivation to get this Guest Room Makeover off the ground! I've only got 6 weeks to pull this off! Wish me luck. I've been itching to finish our guest room, ever since my oldest son abandoned it to head off to college. The plans include a queen bed...so he was happy to ditch his twin when he comes home for visits and gave me the thumbs up to proceed. I envision this space as a calming retreat, something with soothing colors and texture, but nothing too busy. I want my guests to be able to relax in this space...and sleep well...so I see beautiful, sumptuous bedding, maybe a touch of soothing aqua on a piece of furniture in the space. I already have the bed. It belonged to Mr DIY and I for years, until we upgraded to a king. As you can see, it doesn't exactly fit with my vision for the room...but there's nothing that paint can't transform so I plan to paint this bed as the first step of the challenge. Be sure to check back next Thursday when I reveal the painted bed makeover! To see the rest of the participating rooms in this ORC Spring 2015 event, head to Calling it Home. That dresser and that mirror are so pretty!!! This is going to be a beautiful space Cindy! Yay, I can't wait...hope I can pull it off! Thanks so much Emily. Ooh, I love your vision board! Can't wait to see the reveal! Thanks Julie, if it turns out as I'm envisioning...I may need to switch bedrooms, lol! Love the blue,rustic dresser. Going to be great to see how it all turns out. Thanks so much Linda! I'm eager to get all the projects finished! I love that dresser on your mood board. 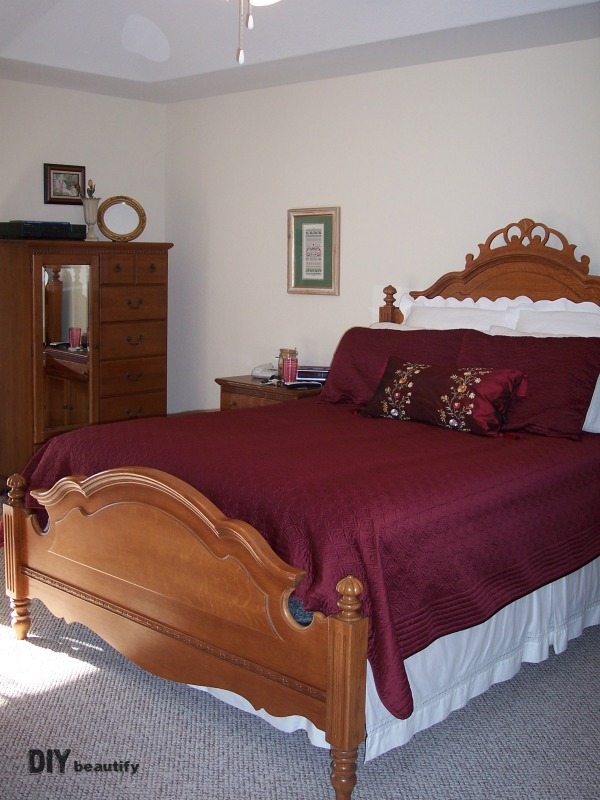 This looks like it will be a tranquil retreat for any guests that get to use that room. Good luck over the next few weeks. I know what you mean re. unfinished projects! That's what is so great about ORC - you're motivated to get things done!!!! Looking forward to seeing your progress over the next six weeks. Exactly Natasha! Some projects just don't get off the ground unless you have a good reason! I'm so happy you're following my progress! !